Two Dirty little secrets nobody’s willing to talk about… Until now! Radio talk show personality and activist Marti Oakley has dared to ask the question: are rules and regulations intentionally being written to encourage the Medical system to systematically “cull” the very sick and the old from the rest of society by confiscating their wealth, stripping them of their rights and shortening their life? She joins our program this week to shine a light on what she believes are two very real and diabolical practices. Marti shares her stories. It’s up to you to decide. Announcer: [00:00:37] Medical kidnapping and “death by hospice.” Dirty Little Secrets nobody’s willing to talk about… Until now. Radio talk show personality and activist Marti Oakley is here to shine a light on these two very real and diabolical practices. Parents Are Hard To Raise is now available on Spotify and it’s 180 million monthly subscribers. Diane: [00:01:15] Welcome to Parents Are Hard To Raise. Helping families grow older together without losing their minds. 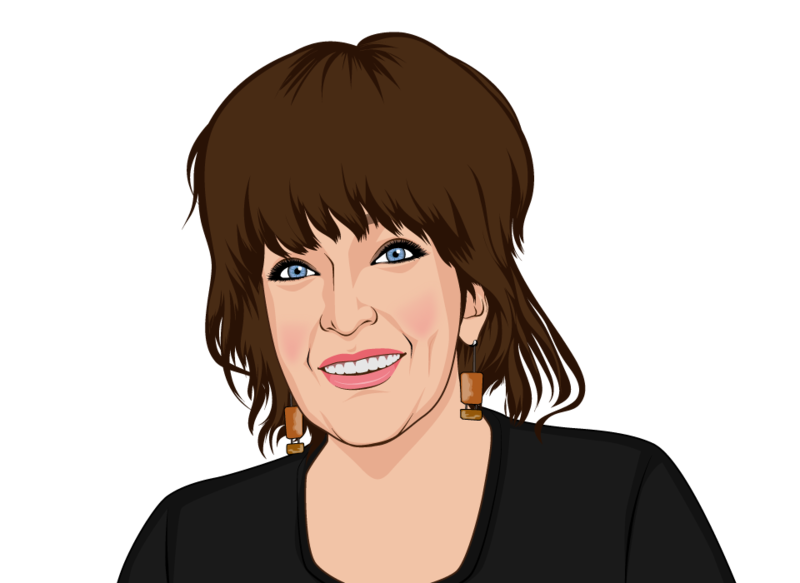 I’m elder care expert Diane Berardi. [00:01:24] Medical kidnapping and “death by hospice” aren’t phrases the average person is likely to use in everyday conversation. But for my next guest, these phrases are not only commonplace, they represent a clear and present danger to each of us, each and every time we have even a chance encounter with the medical system. [00:01:46] Marti Oakley is a popular radio personality, medical activist and advocate for the elderly, veterans and those medically kidnapped for profit. She recently served as panel moderator on guardianship abuses by for profit predatory guardians and attorneys at the Annual Whistleblowers Summit in Washington DC. [00:02:08] Marti Oakley welcome to Parents Are Hard to Raise. Marti Oakley: [00:02:13] Thank you. Glad to be here. Diane: [00:02:15] We’re so glad you’re here. And these topics are… There incomprehensible. I mean you can’t even believe it. 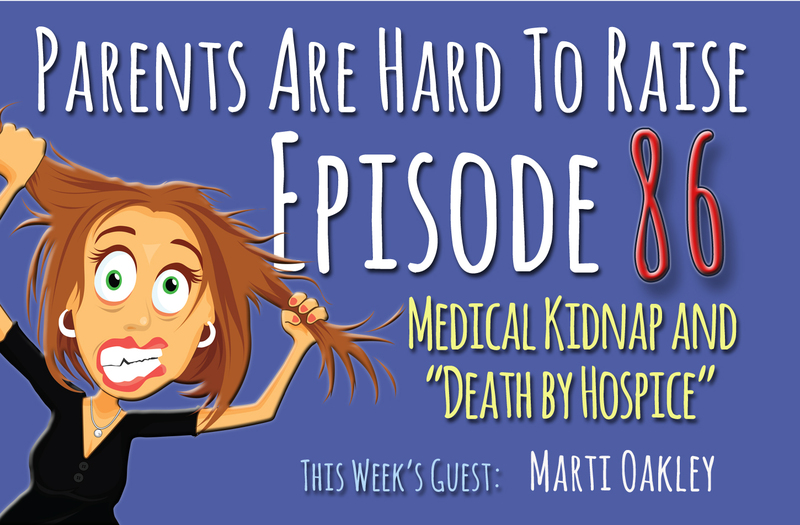 Could you tell us, what is medical kidnapping? Marti Oakley: [00:02:28] What happens… I’m going to use it as an example, a case that took place in Virginia, with Inova Fairfax hospitals, and it was a young woman… a middle aged lady, who she had been in the military was a police officer at that time, had taken two Tylenol one day, and I don’t know if you know but acetaminophen is deadly. It can kill your liver in a heartbeat. I never touched the stuff. But anyway, she had taken two Tylenol for a bad headache and by that evening was on the floor virtually in convulsion. [00:03:01] Sister gets her to the hospital and they gave her Vicodin, which is 50 percent acetaminophen and caused permanent damage. What happened to this woman over the next year was unspeakable. [00:03:14] She did come down with pneumonia, was in Inova hospital and Medicare will only pay eight days. On the end of the eighth day, they wanted to discharge her. [00:03:24] Her sister said no. Because she had a large 12-inch long blood clot in her arm, from where they had tried to install a PIC line. And she said you can’t discharge her with that blood clot. They “Guardianized” her… the hospital’s attorney, Guardianized her and they discharged her anyway, put her in a nursing home. [00:03:46] And then for the next year they bounced her back and forth as Medicare Time racked out. They would bounce you back to the hospital back and back to another nursing home. [00:03:56] During this time she had her heart broken. It was never fixed. Her ankle broken. It was never fixed. The things had happened to this woman were so grotesque, and it’s all documented, and this is medical kidnap. [00:04:09] This is when people ask for a second opinion and suddenly the person that they’ve asked for the opinion for is guardianized. And now they can’t see them anymore. Diane: [00:04:18] Now, what do you mean by Guardianized?. You know, what happened? Marti Oakley: [00:04:23] You become a ward of the State. Which means you suffer a statutory civil death, and it’s equal and its legal consequences to a natural death. You have no rights. You can’t speak. You don’t exist any longer except as chattel property, movable property and goods. And from that point on what happens to you is of no consequence to anyone. Because until your estate is robbed, totally blind, they will never let go of you. The person who gets guardianship, these predators, actually present themselves as you. This is the ultimate in identity theft. Diane: [00:05:07] How does that happen? [00:05:09] Well this was a carefully constructed system, it’s been running about somewhere between 25 and 30 years. Marti Oakley: [00:05:25] I’m 35 and I don’t give a damn what anybody says… [laughing]. [00:05:28] But, anyway. [laughing]… Somebody In here is 35. [00:05:32] Anyway, about 25 years ago, across the states, what they had done was, they came out and said, oh the state courts were just bogged down so bad. And so they were going to separate out family issues and make this whole tertiary system a court. And it was just a way to unburden the state courts. What it actually was… I got into a terrible fight with the state judge over this, down in the Twin Cities. And I said… He said, to me you don’t understand Marti. If we had not done this we would have had to hired more courtrooms and judges. The cost would have been exorbitant. And I said Isn’t that exactly what you did? Only you created a new system, ruled by statute, code and regulation, not the law. Diane: [00:06:43] Oh my gosh. [00:06:49] They don’t have to have any background in law because they are not dealing with law. They only have to be able to read statute and code and regulation. [00:06:58] And so you but you are immediately disempowered and Diane I think one of the most terrible things that happens to families in the face of this, is when they go into these tribunals thinking they’re walking into a court of law. They are not. And they are hit with this wall of corruption, where the so-called judge who is actually only a ministerial clerk or a hearing examiner is colluding with the attorney and the predator Guardian who’s levying charges against the victim and the attorney you may have hired or was appointed. And within minutes people realize it was all decided before they ever walked in there. Everything was done, and they granted these predators can stand up and because these are tribunals they’re not required to follow the rules of evidence as they would in a court of law. The Code of Civil Procedure. They’re not required to do any of that. [00:07:56] So they’ll stand up and levy all these terrible charges. Oh, we found them living in filth and squalor. Covered in feces. They were starved. They were dehydrated. They were beating them… They never have to show any proof. They are never asked for any proof. No evidence. And the hearing examiner will not allow any evidence to be produced, put on his desk read into the record, that would refute what those predators are saying. It’s all a done deal. Marti Oakley: [00:08:40] The hospital attorney is the guardian for her. Or was, she has passed away. And her sister fought a tremendous battle for her, trying to save her life and get help for her. And they absolutely ran the family ragged. Just absolutely ran them ragged. But this, it is such a corrupt system, Diane. Diane: [00:09:06] I mean it’s hard to imagine. Diane: [00:09:09] Yes. It’s human trafficking. [00:09:10] This is trafficking. Just Because it’s done under the auspices of a tribunal does not make it any less so. And in every year they estimate somewhere between five and 10 billion that’s with a B is stolen from elderly individuals in this country under this guardianship system. Marti Oakley: [00:09:30] Excuse me, I have a slight cold I’m sorry. Diane: [00:09:35] No that’s okay. Marti Oakley: [00:09:37] It is… I Said then I said at the summit it is the biggest transfer of wealth going on in this country and nobody talks about it. Diane: [00:09:45] No. You don’t hear about these things. Marti Oakley: [00:09:47] No. No. And the other thing, you know, and this can happen to anyone. I mean we have children, who, their parents wanted to seek a second opinion based on the projected care they were going to get. And they guardianized the kids. That’s medical kidnapping. And now the parents can’t even see their own child. [00:10:09] They can’t know what’s going on with them. These kids always somehow happen to die. And about 80-percent of them are Black or Hispanic. Diane: [00:10:18] We’re going to continue talking to Marti Oakley. [00:10:21] But if you are a woman, or there’s a woman in your life there’s something you absolutely need to know. [00:10:29] I want to tell you about my friend Katie. Katie is a nurse and she was attacked on her way home from work. She was totally taken by surprise. And although Katie is only 5 feet tall and 106 pounds she was easily able to drop her 6 foot 4, 250-pound attacker to his knees and get away unharmed. Announcer: [00:12:29] You’re listening to Parents Are Hard To Raise. Now… thanks to you, the number one eldercare talk show on planet Earth. [00:12:38] Listen to this and other episodes on demand using the iHeart Radio app. iPhone users can listen on Apple podcasts and Android users on Google podcasts. Diane: [00:12:55] I want to give a big shout out to Greg from Edmonton, Canada who listens to our show on his smartphone with Apple podcasts and he showed his cousin how to do it. And also Louisa from Rio de Janeiro in Brazil who listens on Spotify and she showed her neighbor how to listen as well. [00:13:15] A big shout out, because remember there’s so many new ways to listen to our show. I can’t even keep track of them. But you have Roku. Spotify. Podcasts… Apple podcasts, Google podcasts. Apple TV. Direct TV. Alexa can play the show for you. [00:13:32] So if you’re listening one of these new ways please help someone else learn about the show and tell them how to listen. [00:13:39] So Marti, we also want you to talk about “death by hospice.” What does that mean. [00:13:50] Okay. Hospice is… and they’re operating on their former branding of Good Samaritan which was quite accurate. They were a wonderful, wonderful organization. If you had someone terminally ill that needed it. They served a purpose of keeping people company, helping was made minor things you know and they would also give the family a break. Marti Oakley: [00:14:14] I know when my brother was terminal in 2001 he was dying from Agent Orange in Vietnam. Diane: [00:14:22] Oh, I’m sorry. Marti Oakley: [00:14:23] They were absolutely invaluable to us. [00:14:28] Under the Affordable Care Act, hospice got Eleven and a half billion dollar infusion of cash to go from Good Samaritan to basically the Grim Reaper. [00:14:39] And now your doctor simply has to say that you’re terminally ill, and by the way we have rescued four people from hospice who were put into it under being termed terminally ill with six months or less to live. The disease they claimed they had. The doctor claimed they had they didn’t have. Diane: [00:14:58] Oh my gosh. Marti Oakley: [00:14:59] But he had begun treatment for them anyway and put them in hospice. Now what happens under those circumstances when you’re terminal. Medicare will pay up to six months. Marti Oakley: [00:15:10] For terminal care. You go in there. The first thing they do is pull food and hydration and they begin drugging you with psychotropic drugs. [00:15:18] In three to four days you’re unresponsive. Your tongue is swollen and hard from lack of hydration. You can’t… People can’t get any kind of a response out of you at all right. [00:15:29] By about the fifth or sixth day the doctor will say it’s called “futility of care.” And once that pronouncement is made they no longer will provide any medical services and the drugging begins in earnest. And this is to keep you quiet while you slowly die. [00:15:45] And then what happens is, whenever they decide it’s time the “Closer” comes in, and that’s how they refer to these people, and give us what we call the “kill shot” and that is 50 percent morphine cut with 50 percent Seroquel or Haldol or Zyprexa or one of these horrendous drugs. And within 15 minutes to an hour it’s all over. [00:16:11] “You don’t want them to suffer do you. You don’t want to put that they’ve had a long life. They need to go.” Now when the family’s not around what they’re saying to the victim is, “You need to let go. You’ve had a long life. Don’t put your family through this. Don’t make him suffer like that.”. Diane: [00:16:27] Oh my Gosh. Marti Oakley: [00:16:28] I went to an orientation about six, seven years ago on this. And I finally got up and I just basically wanted to know what was going on. I had no intentions of going to work for them. And I finally got up and told the registered nurse who was heading this meeting. I said, “Why don’t I just get a gun and put a cap on her head.”. [00:16:47] I said, “it’d be more humane than torturing them like this.” And me and about six other people left. [00:16:55] It is one of the sickest things but it’s a culling, Diane. They are getting rid of the elderly, the disabled and the chronically ill. And you can’t look at the figures and not realize that there is a plan in action. Health and Human Services 2010 they published in 2011 the statistics. Two point three million people on Medicare died. Nobody said a word. And 80 percent of them were in hospice. Diane: [00:17:26] It’s Unimaginable, really. Diane: [00:17:31] But I could see… You know I had a family member recently and you kind of, you know, they… You can see where they’re saying, “well we want to calm the person down.” And so then they’re saying well they can’t… They’re Not eating, they’re not drinking. But there’s they’re stoned. [00:17:52] Exactly. Yes. You hit it right there, Diane. They drug them up take a tray and set it in their room. They know damn well these people can’t raise their hand. They’ve drugged them so bad they can’t. They come back and, “oh you don’t want to eat, huh,” and walk out with the tray. And they won’t feed them. They will not feed them. [00:18:25] And the Pathway system is hospice today in the United States. And the first year it was out they killed 13000 people and then the doctor just came out here at the end of 2017 and said, This year we killed 33000 people in the Pathway system. [00:18:43] And they’re doing this globally. Through my own show I’ve heard from people from the summit, heard from people all over the globe. And I get the same thing. “Marti, they’re doing the same thing here. They’re doing the same thing here.” You know this is it is a culling. It truly is. Diane: [00:18:59] I was going to say, were weeding out certain groups. Marti Oakley: [00:19:03] Are a “waste population.” We no longer produce. So we are considered a waste population and disposable. And we are considered a drag on the economy. And so… Let’s just get rid of them. And then you have to look at too, the federal government ows Social Security three point seven Trillion dollars. Diane: [00:19:25] I was going to say, yes, Social Security. Marti Oakley: [00:19:27] Yeah. And they have no way to pay it back and never intended to. And they keep taking more money out of Social Security. And so it just you know it’s a matter of economics as far as the government’s concerned. They get rid of us. Yes we do the same thing to veterans. You know, we do the same thing to them veterans. [00:19:51] Veterans? We do the same thing? [00:19:53] Yes. You really believe 22 veterans a day are committing suicide? They’re being druged to death. That they’re given Seroquel, Haldol, Zyprexa… In elephant doses, 400 milligrams, and told to take it before they go to bed. It says in every one of the circulars for those medications, each and every one, do not take within four hours of bedtime, because they can stop your heart. And they tell them to take two and three of these medications at bedtime so they can rest. And they sure as hell do. They don’t wake up the next morning. [00:20:24] Oh my gosh. Yes. Diane: [00:20:27] So how do we protect our parents from these things? Marti Oakley: [00:20:34] Well, I’m going to tell you, you can go to an estate planner but you’re getting defrauded. There either are not the experts in elder law, they claim to be or they are knowingly selling you a document that they know can be discarded, at will, by any hearing examiner as if it never existed. All that estate planning and everything else can be discarded, and is routinely discarded by a hearing examiner in these probate tribunals, saying well you’re incapacitated if you were incapacitated today you must have been five years ago, ten years ago or a year ago when you took out these estate plans. And they hand all of those rights, the property, everything over to that predator guardian. And then between them and the attorneys they start carving up the estate. [00:21:20] But it isn’t just… when I was first in this, Diane, it was just the people with estates that they were after. They had some wealth. Marti Oakley: [00:21:28] But now see, Medicare and they’ve paid Medicaid to Medicare. So now you can, regardless of your income, you can get a Medicare policy. It has Medicaid attached to it. And that means that when you die the state, meaning the insurance company, who is doing business for the state, can come and attach your property even if there is a surviving spouse, even if there’s joint tenancy or a cone on property. They can attach that and take what they claim they paid out for you for medical care, before anybody gets anything. It is… I’m telling you is it’s obsered. Marti Oakley: [00:22:18] Yes, it is. It is. And how can you protect yourself? I’ve been working on that for 10 years and so have many other people trying to get this system stopped, trying to get it slowed down, to try to get it changed to where it’s back under the law. [00:22:35] I think, Diane, if you’re going to steal someone’s identity to them and declare them legally dead you know in the statute you ought to do that in front of a jury. Produce your evidence. [00:22:47] You know… That this person should be deprived of life liberty and their identity, along with their property. Do that in front of a jury and let a jury decide. But this is exactly why you’re in a probate tribunal. They don’t allow juries. Marti Oakley: [00:23:04] You know there’s just that hearing examiner up there and he’s working with the same people who came against you. Diane: [00:23:11] And this is… With medical kidnapping, it’s used for profit. Marti Oakley: [00:23:18] Yes. Yes. Everything you do. It’s like when you go in the hospital now you get admitted. The first thing that’s done unbeknownst to you is they run an asset search. Now I ask, why are you doing this? [00:23:33] “Well… You Got my insurance cards, what’s your problem?”. [00:23:37] “Well we just want to make sure.”. [00:23:39] And then you want to watch that sign, in that admission form, because of the word “biologics” appears on there anywhere. We don’t vaccinate. I won’t allow… I have two of my granddaughters that I raise, didn’t allow them to be vaccinated. I don’t vaccinate. We don’t get this crap other people do. [00:23:57] And, um.. But the word biologics they can administer anything including vaccines. They can do experimental blood work with you. There’s any number of things that falls under this loose tag of biologics. You want to cross that out. Put your initials next to it, scribble that out. And then under your signature write “Absolutely no vaccines under any circumstances.”. [00:24:23] One of the things they’re doing now is, they come in in the middle of the night when you’re in the hospital. They’ll come in and tell your family member, “visiting hours over you need to leave now.” You don’t need to leave. You stay right there and they can’t make you leave. Marti Oakley: [00:24:36] You stay there because what they’ll do. They’re all hospitals are all using “Hospitalists” who are contracted doctors to that hospital. And so they will give orders and then the nurses come in in the middle of the night with this big long list of all these tests and blood panels that are going to be done and everything else, “just to check and make sure…” No you’re not. No. you just put that down. [00:24:58] “Well the doctor ordered it.”. [00:25:01] And so. But you want to stay there with them because they’ll come to do the damage in the middle of the night. And that means the administration of vaccines, medications you you don’t want or you don’t want your loved one to have like opioids and things like that. So you want to stay with them all night long. [00:25:21] But it has gotten to the point with these physicians that questioning them is for some how is it you know it’s… it shakes the cosmos. And so now you have to be punished because after all you know there’s divine beings and so they Guardianize you. And basically it’s called “Medical kidnap” and they have the hospital, the attorney at the hospital, Guardianize you. And now your family can’t see you and you have no control over that child’s care or your loved one’s care. You can’t know what’s going on and what’s done to them. Nothing. Diane: [00:25:58] So, one of the things is if they are in the hospital, I always encourage people, family, someone to be there. And if you can’t and if you don’t live in the area, I tell them to get a hospital sitter, someone to stay with your mom and dad. Yeah. So that they’re not alone. Marti Oakley: [00:26:16] Right. And they have every right to be there. And so you don’t want them there alone because I say that dirty work is done in the dead of the night. Marti Oakley: [00:26:27] Yeah. Because when nobody’s there to witness what was done and then of course now they’re looking to get rid of all those medical files prior to 2007. So this is going to get ugly. Diane: [00:26:39] Oh my gosh. Marti, tell us about your radio show. How can people listen? And your website. How can people reach you? [00:26:50] My web page is the PPJ Gazette it’s www.ppjgazette.me there’s like: pop, pop, jump, go dot me. And I have TS Radio on blog talk and we’ve been there nine and a half years. Diane: [00:27:07] Fantastic. Thank you so much for being a guest and enlightening us. Marti Oakley: [00:27:13] I appreciate it. [00:27:15] I hope you got something out of this episode. I know I did. I love getting your e-mails and questions so please keep sending them. You can reach me at Diane parents are hard to raise dot org or just click the green button on our home page. [00:27:29] Parents Are Hard to Raise a CounterThink Media production. The music used in this broadcast was managed by Cosmo Music, New York, New York. [00:27:36] Our New York producer is Joshua Green. Our broadcast engineer is Well Gambino and from our London studios, the melodic voice of our announcer, Miss Dolly D.
[00:27:47] And I have two favorites to ask of you. Please show someone else how to find the show. And please, if you like the show give us a five star rating, that will help other people find our show as well. Thank you so much for listening. [00:28:00] Till next time… May you forget everything you don’t want to remember and remember everything you don’t want to forget. [00:28:06] See you again next week.